Suitcase for Pre-Schoolers: Will your Trunki hold up? This photo was taken 3 years after the one below. Yep, our 6 year old loves it just as much as she did when she was 3 – and a pre-schooler. The popularity of family travel has caused parents, grandparents, and toy manufacturers to come up with creative ways to keep kids entertained and engaged en route to their destination so the whole family can enjoy the journey. One of the best ideas I’ve seen yet is the Trunki – a durable plastic suitcase suitcase for pre-schoolers. They can pack it, ride-on it, and pull it along behind them. Suitcase for Pre-Schoolers: Same child, age 3 with her Lady Bug Trunki. Trunki – Terrance (Blue) , Trunki – Sunny (Orange), Trunki – Iris (Purple), and Trunki – Jade (Green) . 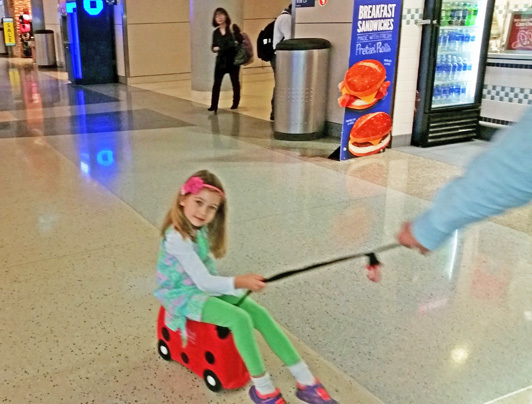 The three-year-old in our family likes to sit on it and scoot herself through the airport, but when she gets tired, she’s happy to let Papa pull her. In addition, a shoulder strap allows adults to carry the Trunki when required. The suitcase is big enough to hold books, toys, and in-flight snacks, but small enough to fit in the overhead compartment of any aircraft. Initially, I questioned whether the bag was sturdy enough for a 35-pound child (and didn’t want to find out in the middle of a busy airport), so we tested it at home and – voila – it worked like a charm. Our pre-schooler enjoys having her own rolling luggage – like the grown-ups – and the Trunki keeps her entertained in the airport, as well as storing things she enjoys during the flight and once we get to our destination. When I first heard about the Trunki, I had a hard time visualizing how it actually functioned, so you may want to click here to watch a video of a Trunki in action. 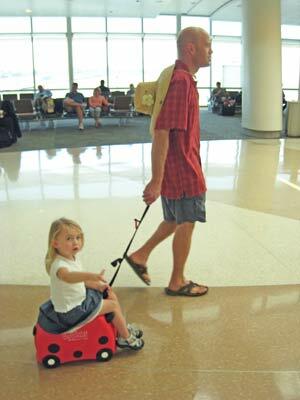 >Such a useful equipment for those parents who likes to travel a lot together with their child.